RSS feeds might not be once popular like they once used to be but they are still useful in reading the latest updates from the blogs and sites that you follow. They are good for reading news or actually a compilation of news headlines from a group of sites. You do not have to open individual sites one by one to get to their headlines with RSS. Due to the reasons above, RSS is of great use and so are RSS readers. Android users are known to use apps like Pulse and Flipboard to get the latest news on variety of topics. They are not RSS readers but they do provide latest news from the latest sources. But those apps lack the functionality to add some local site to the news feed. In such situations, RSS readers for Android come to great use. You can easily read news from the sources that you choose right in your phone. Android has some RSS Feed readers but a good one is all that you need. With a very attractive app design this app has gained the interest of many users. With 1 Million to 5 million installs shown in the stats of the app store, this is the app for you if you want to read RSS feeds in a stylish magazine like layout. 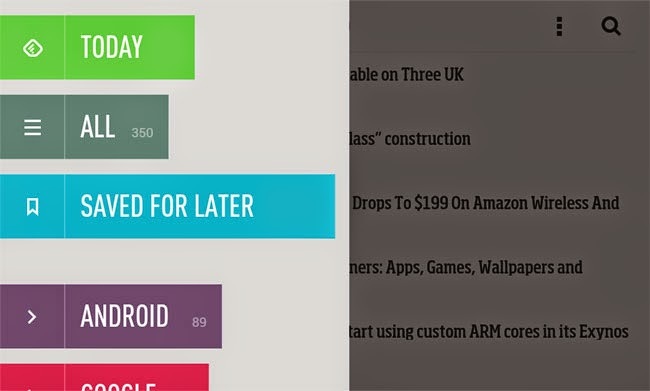 Add your favorite RSS feeds and group them into colorful categories. This app uses the swyping feature of android to switch between different pages of news headlines. This app is smooth and gives you a feel or reading a magazine in your phone. This is by far the best RSS reader for Android. 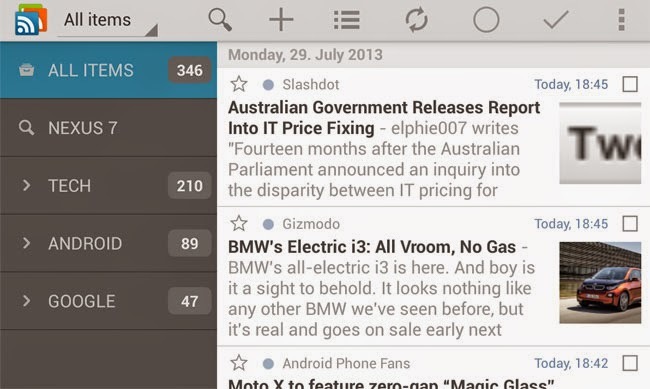 gReader is another popular RSS reader for Android. The layout of this reader is simpler than feedly. The features seems to be the same. You can import the feeds from Feedly into this if you want to make a switch. The layout is simple and provides you with the ability to switch the themes from a bright layout to something dark, if you like it that way. You can also download the articles that you open in gReader and save it for offline reading later. The above two apps are the only ones that I will be listing for RSS feed reading in Android. I can't suggest you the best one out of these two. May be I will do a comparison of these two soon. I recommend you to try out both these simultaneously, like me. I just added my feeds to feedly and imported those feeds from feedly to gReader. I like them both at the moment. I like the simplicity of gReader while feedly is quite attractive with the sliding motions. Both are good in their own ways. Try them both and keep the one that you like if not keep them both.